The last few years of AR development have been a whirlwind, and the wheat has been separated from the chaff. Proprietary mounting systems have all but disappeared from the market, leaving three standards parked at the top. 1913 / Picatinny, Keymod, and MLok. A basic standard has been set for length, (12-14″), strong, simple attachment, and an expectation has surfaced for weight, or the lack thereof (sub 9oz). As shooters we’ve streamlined our rifle setups, and the companies providing accessories have minimized their footprints to incredible levels. 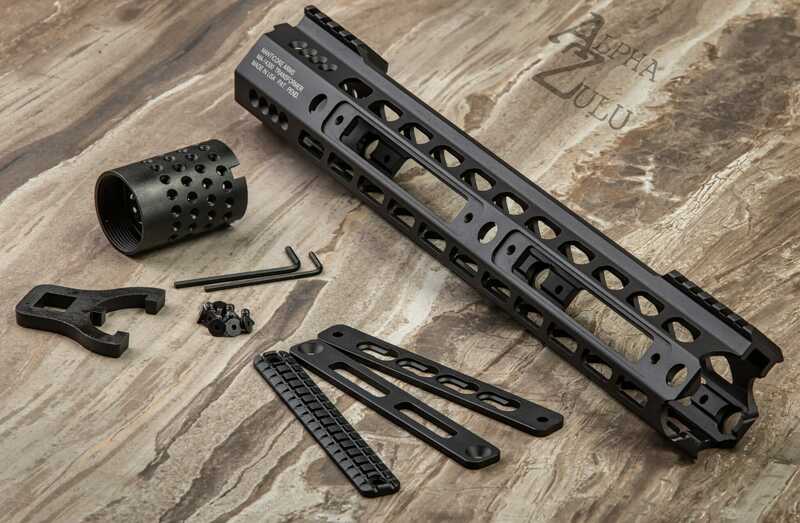 Taking that all into account is the Manticore Arms Transformer Rail forend “chassis” system for the AR15 rifle, which features an interchangeable panel system allowing the use of Keymod, MLok, polymer and G10 grip panels, and of course (soon to be released) picatinny/1913 rail. Starting from the rear is a new Patent Pending barrel nut and method of attachment. The heat treated 4140 steel, black oxide coated barrel nut has 6-32 threaded holes around it’s circumference in two offset rows – twice as many as others on the market. In use what this allows when installing is a “halfway” position between where you would normally find them. Installation is simple, torque to your desired range – if you haven’t lined up one of the rows of holes to attach the forend, a few ft/lbs either direction will put you in-line perfectly – visual adjustment is simple ahead of installing the forend, just align the very top row with the gas tube – while it does help to install the gas block and tube before the barrel nut, as Manticore has outlined in the instructions, I’ve tried it both ways with no issues – and the rail will slide into place. allowing you to install the 10 6-32 screws. The included allen key actually proved to be a better tool for this than my standby Wheeler FAT Wrench, When the allen key starts to flex, proper torque has been achieved. Those 10 screws in combination with the two anti-rotation tabs make for a very secure and simple fit. Moving forward you’ll find a continuous to the receiver rail 4 slot section of picatinny rail (enough for DBALs and other laser/IR illumination tools, or bringing a scope ring forward) which leads into a scalloped top section with large ventilation slots. At the forward most portion you’ll find another receiver height rail section – this one a 5 slot. Enough for your front BUIS and some light mount/combo solutions. The scalloped top portion provides not only weight savings, but a comfortable surface for the C-Clamp grip style, with no occlusion of sight picture by your support hand thumb. On that point, and of special note, the sides of the scallop and the ramps to the rail sections all feature chamfers and compound radii and have no sharp edges or lips. Along the profile of the rail, before we get into the panel pockets themselves, you’ll find a not quite octagonal profile – the forend was developed around the latest 3D printing technology and multiple prototypes until an optimum shape was engineered – the angled areas from the side flats to bottom flat are shorter than the ones on top. This makes for a very compact and low profile shape, which again has very pronounced radii at the corners leading to an extremely comfortable surface. There are three sling QD sockets on each side, found at the rear, mid-point, and front, and two more on the bottom flat, mid point and front, for a total of 8 built in mounting points (these are not non-rotational). 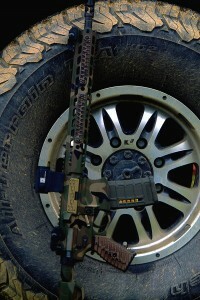 Mlok and Keymod on the same forend – in this case Noveske NSR panels and a Magpul light mount. development of the forend, and I feel I can help clear up the direction and concept we had in mind for the panel system and it’s overall intent. We didn’t set out to create a “standard” – and it’s not licensed, it’s not open source, etc. 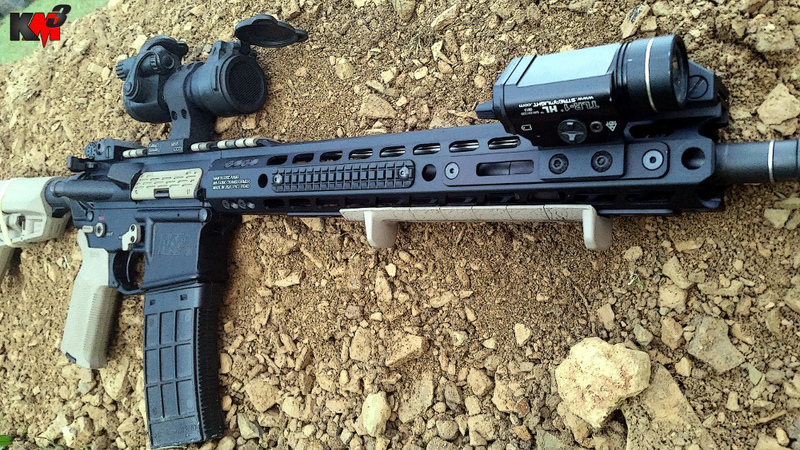 We set out to create what we see as a Chassis System in the form factor of an AR15 forend. It’s not up to us what you put where, it’s not our concern – the goal was to give the user that freedom in any way possible. More on that in a moment. The panel “slots” are inset into the forend, and feature an inner ledge around the circumference, and a straight – through cut. They are secured with two 8-32 screws. 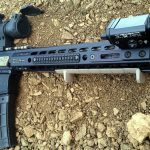 The purpose of the design is to allow the inset of the panels and the flat ledge to resist all force except straight-pull out from the forend, which is the only direction (and the least likely encountered) in which the screws are stressed. The through cut found in the center of each panel slot is to allow the various mounting system hardware pieces unobstructed room to fit and function. To date the dimensions of the panel themselves and the through-cut allow for adherence to the TDPs of the available system 100%, and compatibility with future systems is very likely (see the Development of the Panel system article for more information on this feature). The threads in the rail itself are cold rolled into another interesting feature of the extrusion, three inner “ribs” allowing the proper thread depth and lending the forend more strength in spite of the large openings. The MLok and Keymod panels feature two/four slots respectively, and are made from anodized 6061 aluminum, while the grip panels from Manticore are made from a proprietary polymer (available currently in black) in two styles. Frag, which offers an aggressive look and gripping surface, reminiscent of a pineapple grenade, and Snakeskin, which is a very unique pattern offering a lot of grip without being rough, and a very aesthetically pleasing pattern of concentric overlapping curves. 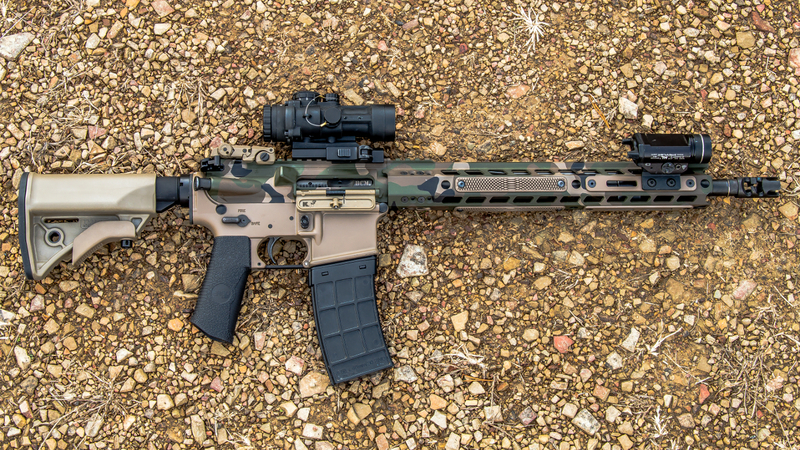 Recently another exciting addition was added to the lineup, G10 material panels in a variety of patterns expertly machined by Executive Ordnance, to match their high end line of AR15 grips – more on those grips and panels in an upcoming article. As I understand, other panels like 1913 rail, and even direct attach accessories will follow soon. In use overall, the forend is comfortable, feels lighter than it’s listed weight – the forend is only 7.4 oz, the 3 oz of the barrel nut is right at the center of gravity of the AR and is not as noticeable as the number makes it sound. 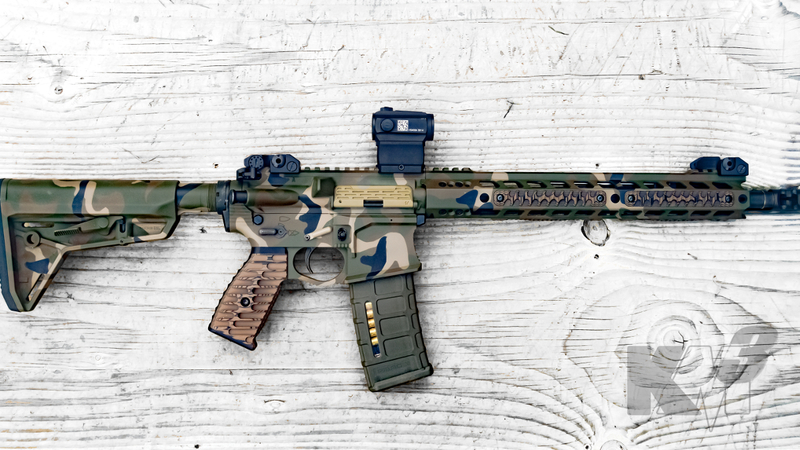 The panels make customizing the forend a snap, as Manticore Arms state, “What you want, where you want it.” It’s a new direction and an exciting addition to the AR platform. Check out the pictures of my custom build with a Transformer Rail both here and in the gallery, take a look at the video below by the We Like Shooting crew for Sven from Manticore’s take on the product, more information on Manticore’s Facebook and of course check it out directly at Manticore Arms. Available now.